When you shop for faux grass in one of our stores or at our showroom in San Rafael, do you know how to choose? Artificial turf face weight is one of the first things you should look for when choosing a fake grass. The higher the artificial grass face weight, the more soft and dense the lawn will be. You will also want to think about the type of grass blade. Not all blades on plastic lawn are alike. At Watersavers Turf, we offer a range of faux grass at varied price points, with face weights and blade styles ideal for commercial and home uses. Get to know “face weight” and other industry product terms, so you know how to choose the right artificial turf for you. When you shop for synthetic lawn, you’ll find out that there is more than one type of grass blade. There are two basic classes of blade. “Engineered” blades have advanced design features that give them unique value, so they can do things like stay extra cool in the sun. “Standard” blades are less specialized and are a great choice at a lower price point. There are multiple types of engineered blades. Two of the most popular types are S blades and W blades. An S blade diffuses sunlight so that the grass doesn’t show glare. Even in bright sun, plastic grass made with an S blade has the matte look of a live lawn. A W blade is built to retain moisture. Why would you need that? Because if the blades hold more water on the lawn instead of letting all the dew or rain evaporate, the grass stays cool in hot weather. Blade design can make one kind of turf better for homes while another is better for soccer fields or putting greens. W and S are just two of the shapes that make engineered blades special. In fact, all engineered blades stand out, literally! Standard blades can’t stand up alone. They would lie flat, but a “thatch” of curled brown and green fibers around the base of the blades holds them up, so the grass stands tall. Engineered blades have more vertical strength, and don’t rely on the curled fibers of the dense thatch to hold them up. There is still a thatch around them, though, to add extra support to the base and help the lawn last. Our expert staff can tell you more about the blade styles available, and help you find the right blade for your budget and your landscape. When the blades and thatch are put together, this makes something called the “face weight.” You’ll see this number listed for every kind of fake grass. This term just means the amount of fiber material per square yard of lawn. It doesn’t count the backing at all, only the blades and the thatch. The higher the face weight, the more densely tufted the turf. Most people prefer the feel and look of a dense faux grass, with a full and thick carpet of soft blades. Top-quality products have high face weights, up to or even beyond 90 ounces per square yard. However, material costs do affect the price point. It costs more to make turf with a lot of blades and thatch. An artificial turf choice for shoppers on a tighter budget often has a face weight of 40 or 50 ounces per square yard. While a high weight lawn is a must for some yards or pro sports fields, a low weight grass can still do the job well. It’ll also be at a lower price point. 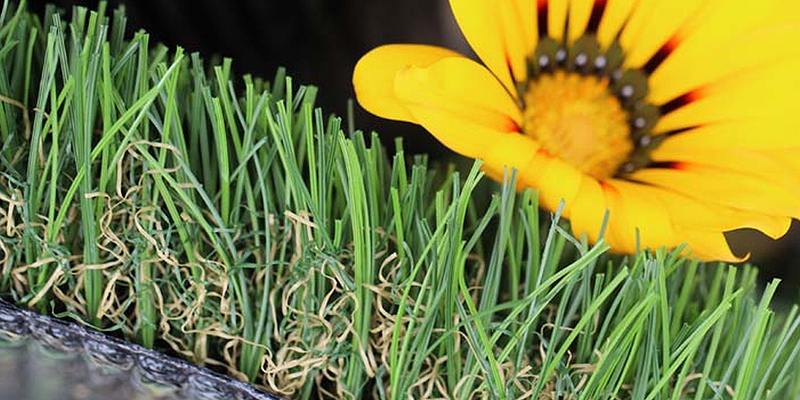 Synthetic turf for a dog run or pet enclosure doesn’t need to have as high a weight. In contrast, grass that’s meant for playing high-impact sports like football or soccer needs greater density to prevent injury. When crunching the numbers, shoppers often discover it’s a good long-term investment to opt for a higher weight. The more full and sturdy the artificial lawn the better it will stand up to wear and traffic. However, if your lawn doesn’t see heavy foot traffic, and the visual appeal and color matter more, a lower weight can be fine. When looking at cost and the best deal for your money, its important to know is that there’s no single right choice. There’s only what is best for your landscape needs. To talk to an expert about your landscape, contact Watersavers Turf online, visit one of our stores, or call us at (844) 974-8873.